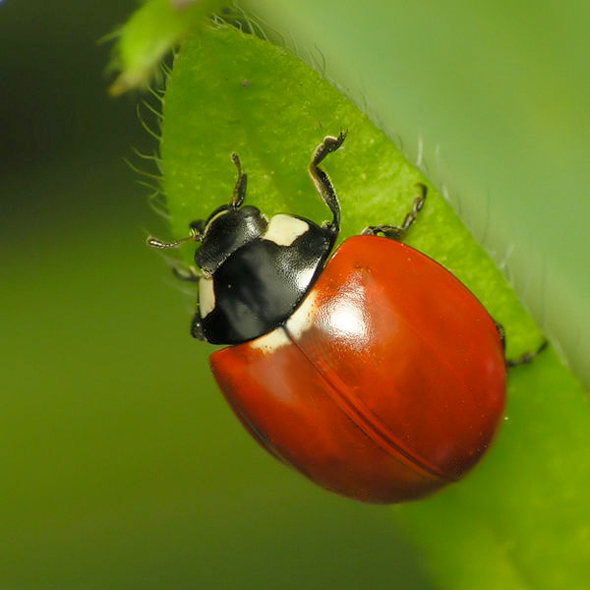 This tutorial shows you how to use the clone tool in Photoshop to successfully airbrush out spots from a ladybird. This photo manipulation technique is widely used and can be copied to remove blemishes and wrinkles through to removing whole items from a photo or extending an image. The clone tool is the only tool required in this photoshop tutorial, see below for details on how to use it to the best effect for airbrushing. This is our original image, that we will be using as a base for this technique. The photo is by photographer Dominik Stodulski, this photo and other works can be found on the Wikipedia Commons. Open up the photo you wish to modify with the airbrush and duplicate the image in the layers palette. (Drag the photo layer into the ‘add new layer’ icon to the left of the bin in the layers palette to craete a duplicate). We do this to keep an original copy of the photo within photoshop if we need to go back to it at any stage. We will be making the changes to the Layer 1, so make sure it is this layer that is highlighted in the layers palette. Choose the clone stamp tool from the Tool Bar. In the application bar for the clone stamp, change the opacity to 35%. Right click the canvas with the clone tool selected (Ctrl Click for Mac) to change the diameter of the Clone brush, reduce the hardness of the brush to around 10%. The brush size you need will depend on the size of the image that you are editing and the size of the shape you are airbrushing. Repeat this step if necessary to change the brush size. To remove the spot below you will need a brush around the size of the circular marker. So always use a brush quite a bit smaller than the area you want to airbrush with the brush hardness turned right down, with the opacity of the clone stamp also reduced. To pick the area / colour that you want to clone you need to press the Alt / Option key as you click on the canvas. Wherever you click will be the place that the colour is taken from, it will be shown as a cross hair on the canvas as you select it as shown below. After selecting the area you want to clone, move the cursor over the area you wish to airbrush, so it is half covering similar colour and half covering the area you wish to change, click the mouse to use the brush. You should select a new area to clone from every 2 or 3 clicks, and work your way around in a circle, this provides even natural colour and will stop bands of colour appearing as you perhaps work from a darker area into a lighter area or vice versa. Be aware that whatever is in the area that you choose to clone from will be copied into the new position. The marks below show on this particular picture which areas would be best to avoid cloning. Use the clone tool on these smaller areas first to eliminate areas of colour that can be duplicated when airbrushing the larger spots. The image below shows the first stage of airbrushing, where just the bottom area of the spot has been cloned. Some of the colour is still showing through because we are using a brush with low opacity, it will take longer to cover the area, but will provide a cleaner, natural look in the long run. Make sure these areas are fully smoothed and matched in with the surrounding areas before moving on to use these sections of colour to airbrush the center section of the spot. Continue to work clockwise or anti clockwise in a circle, building up the colour from the surrounding areas. Now the whole area is covered, there may be a slight smudge where the colour is just slightly darker or lighter. To remove this, select a large clone brush that will cover the whole area in one or 2 clicks and make sure that the opacity and hardness of the clone brush are still set quite low. Take the colour from a nearby area with the correct colour, making sure the clone tool won’t pick up on any of the smudged area when you use it. Give the clone tool a couple of clicks over the smudged area and it should blend in nicely. When you come to areas that are more complicated such as removing the spot on the ladybirds back where the lines are, you need to keep the clone brush straight instead of working in circles to extend the line. This technique will build up lines of colour, so after you have in place the feature lines, such as the gradient from white to red or the lines on the back, move back to using the circle technique, avoiding using the airbrush over the featured areas. The final image is displayed below. You can use this airbrushing technique on many things to smooth over unwanted areas. If you want to actually combine 2 images, you may be best to position 1 image over the other and use the layer opacity and a layer mask on the top layer. That way you can remove bits of the image and achieve the effect that the 2 images have merged. Hope that helps.